How about another guest post? If you have a swimming pool in your yard, this one is for you. I am dreaming of this someday ... a house in the country with one of those big, round above-ground pools and a bunch of kids frolicking in it while I sit on the deck next to my cute husband supervising and reading my Kindle. Ahhh, fantasies! It's always pool season somewhere in the world right now. And it's always good to ensure that your backyard pool is functioning at its best. You will never know when a party and unexpected guests are coming. Better yet, prepare your pool all the time for your family, friends and important guests to enjoy at any sudden occasion. You probably know that prevention is always better than cure. And when it comes to pools, this quote says it all. It's always better to take simple and easy cleaning steps from time to time rather than clean a totally green and dirty pool that you left unattended for a long time. Addressing problems ahead of time before they get big will pretty much save you more money, time, and effort in cleaning your pool. So here I listed some of the most effective yet very basic pool cleaning tips that any pool owner can easily do on their own. Skim regularly depending on how much debris falls into your pool. Check your pool daily to see if it needs to be skimmed or not. Leaves and bugs normally fall into any pool at any time of the day. Always remember not to let these debris sink at the bottom of your pool. It will most likely stain your floor and will cause bacteria and worse, algae to buildup. Also, get in the habit of checking your strainer basket. Empty it out and remove all debris to avoid it from clogging. This will give your pool a better water circulation and will prevent algae formation. It is necessary to brush the entire walls of your pool every week, especially when your pool is always used. This helps avoid dirt from accumulating. 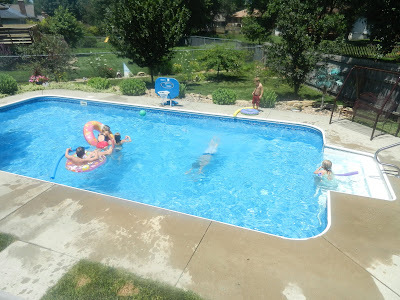 You will need a good and durable pool brush to do this work. It is recommended to know your pool surface before buying a brush to avoid the tiles from getting scratched and damaged. One tip, you can use baking soda to clean your pool tiles easily while brushing them. Very effective! Right after brushing your wall, the next thing you need to do is vacuum. Vacuuming your pool keeps the water clean and clear. It takes away the dirt and any objects that have sunk at the bottom of your pool. It's best to invest in an automatic pool vacuum cleaner to save you time and effort. You simply have to turn it on and let it do the work for you. But if you choose the manual type, vacuum your pool just like how you vacuum your carpet. This step is very important especially when your pool is highly used. You will need to test out the water at least three times a week. Highly used pools are mostly to get water imbalances than the less used ones. Sunscreens, lotions, and tanners disrupt the chemical balance of the water in your pool. This explains why water becomes cloudy after a pool party. Test the water level and especially its pH level to ensure that the water is safe for swimmers. The ideal pH range is between 7.2 - 7.8. Test it out using a testing kit which comes in different types. Check the manual provided for instructions on how to use it. A well maintained water and pH level will maintain the chemical balance and avoid pumps from getting damaged. A short visit to your pool regularly is the most basic yet effective preventive step in keeping your pool clean. This will allow you to check for areas that needs your cleaning attention. This way, you will foresee problems before it gets worse. This is also the right time to check leaks and damages that needs to be repaired. A simple stroll at your backyard surely helps a lot. So these are some of the easiest ways to keep your pool clean on your own. If you want more useful and easy to follow tips check out this great definitive guide. Swimming pools don't have to be a high maintenance work. Proactive maintenance goes a long way on keeping your pool clean, safe and ready to use. It is the best way to prevent problems, but if big troubles occur it's best to call the experts and hand them the work.